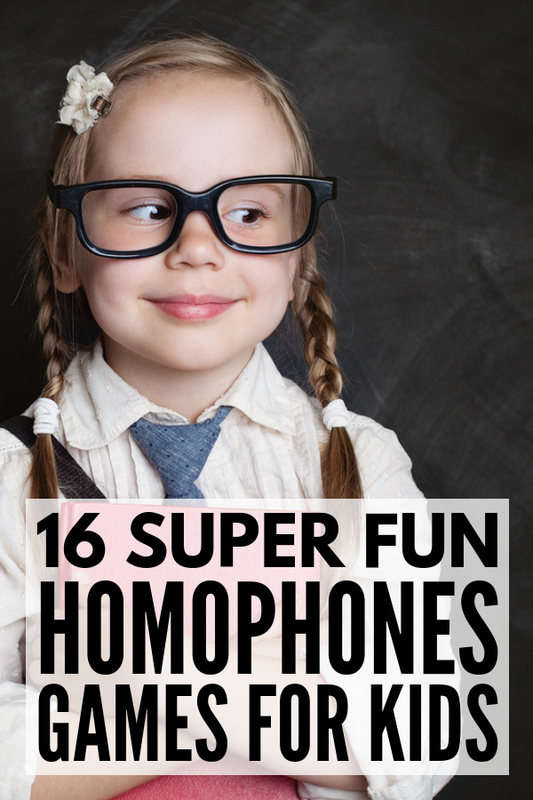 If you’re looking for fun ways to teach kids about homophones, keep reading for some of our favorite homophones games for kids! As a full-time writer and mom, it probably shouldn’t come as a surprise to hear that I geek out whenever my daughter asks me about things related to grammar and language arts. She’s currently in grade 2 and learning about the different parts of speech, and whenever we spend time reading together, I find her becoming more and more inquisitive. She’s always been a strong reader and speller, and it’s been fun seeing her pull it all together so she can start writing all of her stories and ideas down on paper. Of course, there are many different parts of the English language that I completely take for granted, and when my daughter started asking me why some words are spelt the same or sound the same but have completely different meanings, I found myself researching homophones. I wanted to find simple and fun ways to explain the whole ‘same but different’ concept to her, and I found some pretty amazing homophones games and activities for kids that I’m excited to share with you! Before we dive in, I want to take a moment to explain exactly what homophones are. Learning about homophones can be a bit confusing, but this collection of tips and ideas for teaching kids about homophones will inspire you to find simple and fun ways to explain the concept and make the process a little easier. Focus on spelling first. Many homophones sound the same but have subtle differences in the way they are spelled, so if your little one struggles with his or her spelling skills, learning about homophones is likely to be a little more challenging and frustrating. Focus on spelling first before diving into homophones lessons to ensure greater success. Provide meaning and context. Another thing to keep in mind when it comes to teaching kids about homophones is to ensure you’re providing a frame of reference. Is your child/student familiar with the definitions of the homophones you are trying to teach? Are you providing context when discussing the differences between each word? The more relevant information you provide, the easier the lesson will be to grasp. Teach concepts separately. Another great tip to consider is spacing out your lessons such that you aren’t confusing your students/children. For example, before you can teach a child that THERE, THEIR, and THEY’RE are homophones, you want to make sure he or she has a good grasp of what each of these words mean and how they are used correctly in a sentence. Focus on one lesson at a time to keep feelings of overwhelm and confusion to a minimum. Create a ‘homophones journal’. Have your children/students write down all of the pairs of homophones they learn about throughout the school year in a small notebook for easy reference when they are feeling unsure about which word to use during their language arts lessons, and challenge them to write a sentence using both pairs of a homophone each day/week. Practice! Practice! Practice! Like multiplication tables, learning about homophones really comes down to consistent practice, so find ways to incorporate this into your daily lesson plans and/or discussions wherever possible. Review the concepts you’ve already taught your child/students regularly, and each time you encounter homophones together – while reading, talking, etc. – use it as a teaching opportunity. Make it fun! There are so many fun homophones games for kids you can use to make teaching homophones less overwhelming. We’ve shared 16 of our favorites below! And now for the fun part! Check out this collection of homophones games and activities for kids that are sure to get your children/students excited about learning! I hope this collection of homophones games and activities for kids helps you find fun and engaging ways to get the children in your life excited about grammar and language arts! Remember to focus on spelling and vocabulary first, to provide context and teach concepts separately, to practice as often as possible, and (most importantly) to keep it fun! If you liked this collection of homophones games and activities for kids, please share this post on Pinterest! And if you’re looking for more kids activities, please follow our Kids board where we share all kinds of great ideas we find each day! Gwen is a 40-something freelance writer and social media consultant who has an unhealthy love for makeup, hair, and fashion. She lives with her husband and 8-year-old daughter in Toronto, Canada and hopes to move to a warmer climate someday. Preferably tomorrow.